Ultimate Workout and Recovery is a team of Wellness Specialists and Engineers, prompted to create our product by the frustration in seeing individuals who are immobile short or long term who do not have the proper means to get active or stay active and we have now created the fitness product and service to fix that problem. Our goal is to reach ANYONE with our Ultimate and complete convenience gym and EVERYONE who might benefit from our one of a kind system via needing rehab and exercise while immobilized short or long term. We offer THE fitness and rehab solution to remedy anyone with symptoms or injuries that confine them to a bed or chair/wheelchair, and give them the confidence of building strength and maintaining health, as well as the mental component of feeling self-pride and accomplishment as well as independence. Whether elderly, injured, or disabled, a cancer patient who can’t afford to expose themselves to the germs of a gym, or someone coping with a diagnosis such as MS, there are countless people our product can help. Ultimate Workout And Recovery is even perfect for stay at home moms or injured athletes. We are the ONE STOP SHOP fitness and rehab solution for ANYONE able bodied or disabled and perfect for the entire family as well who are able bodied who just want a convenient and fun home gym! MFN professional members receive 20% off Ultimate Workout And Recovery Spider System. PERFECT to use from your bed recliner or wheelchair. 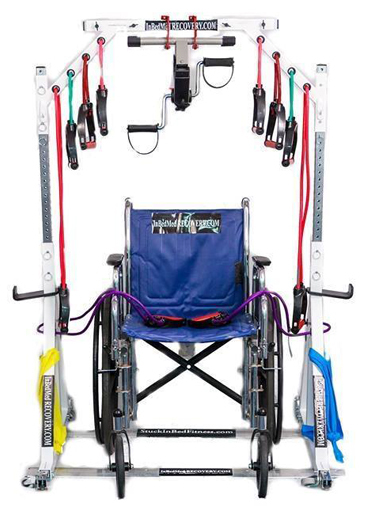 The Ultimate Workout and Recovery Spider System benefits wounded warriors and veterans, athletes, paraplegics and spinal cord injury patients, and bariatric patients, cancer and immune- compromised patients, stay-at-home mothers, care givers, occupational and physical therapists, senior centers, nursing homes, veterans hospitals, rehab clinics, fitness enthusiasts, personal trainers, chiropractors, and anywhere this unit would aid those Stuck-In-Bed achieve maximum fitness and recovery.